If chronic migraines or fatigue are what ails you, there’s hope in the findings of a new study out of Turkey. Researchers from Yuzuncu Yil University have uncovered heavy metal toxicity as a probable cause in this mysterious and debilitating condition that affects millions of people, which means that detoxification and fortification with beneficial nutrients could be a potential cure. There does not seem to be one specific “trigger” that causes migraines, so many physicians are at a loss for how to help patients who suffer from them. The latest research shows that trying to identify a trigger might be the wrong approach. For many migraine sufferers, migraines could be indicative of a metabolic abnormality that requires a dietary or supplemental approach to healing. While identifying and addressing the various triggers of migraine headaches might provide temporary relief for many patients, this approach focuses on alleviating symptoms rather than dealing with the root cause. Looking for metabolic diagnostic indicators, on the other hand, creates a framework for developing a comprehensive healing approach that will provide lasting health benefits for migraine sufferers. Researchers from Yuzuncu Yil University did just that when they developed a diagnostic tool for looking at blood composition. Their hypothesis surmised that migraine sufferers might be suffering from heavy metal toxicity, nutrient deficiency, or some combination of both. It turns out that they were right. The research team compiled a cohort of 50 patients, 25 of whom had been diagnosed as suffering from chronic migraines, and divided them into two groups. They collected blood samples from both of the groups and conducted an analysis of these samples using atomic absorption spectrophotometry. None of the participants had been taking any antioxidants or multivitamin supplements at the time of the study, nor did they smoke, consume alcohol, abuse drugs, or suffer from health conditions such as liver or kidney disease, heart disease, or chronic inflammation. Members of the migraine group had previously been admitted to a hospital for diagnosis and medical treatment in accordance with the guidelines set forth by the International Headache Society. Upon analysis, the research team learned that those in the migraine group had substantially higher levels of certain heavy metals in their blood compared to the control group. These metals included cadmium, iron, lead, and manganese. At the same time, the migraine group was found to be deficient in certain beneficial trace minerals, including copper, magnesium and zinc. 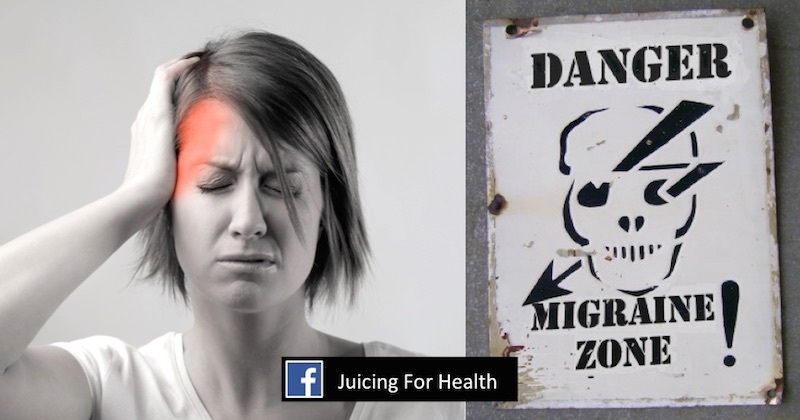 Foods and juices to relieve and remedy migraines. Read: Suggested lifestyle and dietary modifications that help remedy migraines. How to detoxify from heavy metal. Maintaining a proper mineral balance, which includes both “microminerals” (minerals that the body requires in small amounts) and “macrominerals” (minerals that the body requires in larger amounts), is crucial for good health. Based on the findings of this study, migraine sufferers tend to not only have mineral imbalances and deficiencies, but also excess levels of harmful elements inside their bodies. Such abnormalities can lead to hormone imbalances, neurotoxicity, or in this case, excruciating head pain in the form of migraines. The human body requires just the right amounts of trace minerals to perform necessary functions such as nutrient metabolism and enzymatic breakdown, all of which are critical in maintaining homeostasis. When these levels are thrown out of balance, bodily tissue can become inflamed, resulting in a host of chronic diseases. “Interestingly, when the body is deficient [in] a particular type of mineral, our metabolism will typically substitute another type of mineral for that function—one with a similar atomic configuration,” writes Case Adams for GreenMedInfo. This article was originally published by NaturalNews.com. It is republished here with permission. Some of the links I post on this site are affiliate links. If you go through them to make a purchase, I will earn a small commission (at no additional cost to you). However, note that I’m recommending these products because of their quality and that I have good experience using them, not because of the commission to be made. Sara Ding is the founder of Juicing-for-Health.com. She is a certified Wellness Health Coach, Nutritional Consultant and a Detox Specialist. She helps busy men and women identify their health issues at the root cause, in order to eliminate the problems for optimum physical/mental health and wellbeing. Why Processed Meat Is Bad For You, And How It Increases Risk Of Cancer!